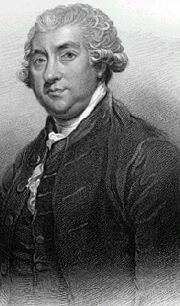 James Boswell, 9th Laird of Auchinleck (October 29, 1740 - May 19, 1795) was a lawyer, diarist, and author born in Edinburgh, Scotland. Boswell is best known for his massive biography of Samuel Johnson. Although Boswell was not the first biographer in the English language, he is almost certainly the first modern biographer. His Life of Samuel Johnson is itself a literary masterwork. Indeed, some critics contest that much of Johnson's fame rests not so much on the quality of his own writings as on the writings of James Boswell. Prior to Boswell, the biographical form had been reserved for dry, scholarly works that reiterated facts and dates in an accurate but uninteresting manner. Boswell's Life of Johnson revolutionized this form by adding an entirely novel and charming personal flair; Boswell wrote about Johnson as if he were someone the reader might intimately know. He incorporated casual conversations between Johnson and himself into the text of his biography, and his ability to interweave personal anecdotes with factual information was so deft that the line between literary narrative and biographical scholarship was entirely blurred. The result of Boswell's Life of Johnson was so successful that it is still considered by many to be the finest biography ever written, securing Johnson's (and Boswell's) place at the focal point of eighteenth-century English literature. Boswell is also known for the detailed and frank journals that he wrote for long periods of his life, which remained undiscovered until the 1920s. These are now considered to be superb works of literary non-fiction. These works included voluminous notes on the Grand Tour of Europe that Boswell took as a young nobleman and, subsequently, of his tour of Scotland with Johnson. His journals also record meetings and conversations with eminent individuals belonging to "The Club," a dining club of prominent individuals centering on Dr. Johnson that included Lord Monboddo, David Garrick, Edmund Burke, Joshua Reynolds, and Oliver Goldsmith. Although his written works focus chiefly on the accomplishments of others, Boswell has become a literary giant in his own right, and one of the most influential authors of non-fiction in all of English literature. Boswell was born near St. Giles Cathedral in Edinburgh. He was educated at James Mundell's academy, followed by a string of private tutors before being sent by his father at the age of 13 to the city's University to study law. Upon turning 19 he was sent to continue his studies at the University of Glasgow, where he was taught by Adam Smith. While at Glasgow, Boswell decided to convert to Catholicism and become a monk. Upon learning of this, Boswell's father ordered him home. Instead of obeying, Boswell ran away to London. Boswell spent three months in London, where he lived the life of a vagabond before he was taken back to Scotland by his father. Upon returning, Boswell was re-enrolled at Edinburgh University and was forced by his father to sign away most of his inheritance in return for an allowance of £100 a year. On July 30, 1762, Boswell took his oral law exam, which he passed with some skill. Upon this success, Lord Auchinleck decided to raise his son's allowance to £200 a year and allowed him to return to London. It was during this stay in London that Boswell wrote his London Journal and met Johnson for the first time, on May 16, 1763; the pair became friends almost immediately. It was around three months after this first encounter with Johnson that Boswell departed for Europe with the initial goal of continuing his law studies at Utrecht University. Boswell, however, spent most of the next two and a half years travelling around the continent. During this time he met Voltaire and Jean-Jacques Rousseau and made a pilgrimage to Rome. Boswell also travelled to Corsica to meet one of his heroes, the independence leader Pasquale Paoli. Boswell returned to London in February, 1766. After spending a few weeks in the capital, he returned to Scotland to take his final law exam. He passed the exam and became an advocate. He practiced for over a decade, during which time he spent no more than a month every year with Johnson. Nevertheless, he returned to London each year in order to mingle with Johnson and the rest of the London literary crowd, and to escape his mundane existence in Scotland. Boswell married his cousin, Margaret Montgomerie, in November 1769. She remained faithful to Boswell, despite his frequent infidelities, until her death of tuberculosis in 1789. After each of his infidelities Boswell would deliver tearful apologies to her and beg her forgiveness, before again promising her, and himself, that he would reform. James and Margaret had four sons and three daughters. Two sons died in infancy; the other two were Alexander (1775-1822) and James (1778-1822). Their daughters were Veronica (1773-1795), Euphemia (1774-ca. 1834) and Elizabeth (1780-1814). Despite his relative literary success with accounts of his European travels, Boswell was an unsuccessful advocate. By the late 1770s, he descended further and further into alcoholism and gambling addiction. Throughout his life, from childhood until death, he was beset by severe swings of mood. His depressions frequently encouraged, and were exacerbated by, his various vices. His happier periods usually saw him relatively vice-free. His character mixed a superficial Enlightenment sensibility for reason and taste with a genuine and somewhat Romantic love of the sublime and a propensity for whimsy. The latter, along with his tendency for drink and other vices, caused many contemporaries and later observers to regard him as a literary lightweight, and not the intellectual equal with the literary crowd with which he wanted to associate. This criticism only drove Boswell into deeper depression and feelings of inadequacy. Boswell was a frequent guest of Lord Monboddo at Monboddo House, a setting where he gathered significant observations for his writings by association with Samuel Johnson, Robert Burns, Lord Kames, Lord Monboddo and other luminaries. After Johnson's death in 1784, Boswell moved to London to try his luck at the English Bar, which proved even more unsuccessful than his career in Scotland. He also offered to stand for Parliament, but failed to get the necessary support, spending the final years of his life writing his Life of Johnson. During this time his health began to fail due to venereal disease and his years of drinking. Boswell died in London in 1795. When the Life of Johnson was published in 1791, it at once commanded the admiration that Boswell had long sought, and it has suffered no diminution since. Its style was revolutionary — unlike other biographies of that era, it directly incorporated conversations reproduced from Boswell's contemporaneous notes from his journals. He also included far more personal and human details than was the custom. Instead of writing a respectful and dry record of Johnson's public life, in the style of the time, he painted a vivid portrait of the complete man. It is still often said to be the greatest biography yet written, and the longevity of Dr. Johnson's fame perhaps owes much to the work. The question has often been raised how such a man as Boswell could have produced so remarkable a work as the Life of Johnson. Among those who attempted an answer were such critics Macaulay and Carlyle: the former arguing, paradoxically, that Boswell's uninhibited folly and triviality were his greatest qualifications; the latter, with deeper insight, replying that beneath such traits were a mind to discern excellence and a heart to appreciate it, aided by the power of accurate observation and considerable dramatic ability. Boswell's Life of Boswell – Ron Schuler's Parlour Tricks. Young Boswell – University of Michigan Library (Digital Collection). This page was last modified on 15 March 2018, at 15:23.